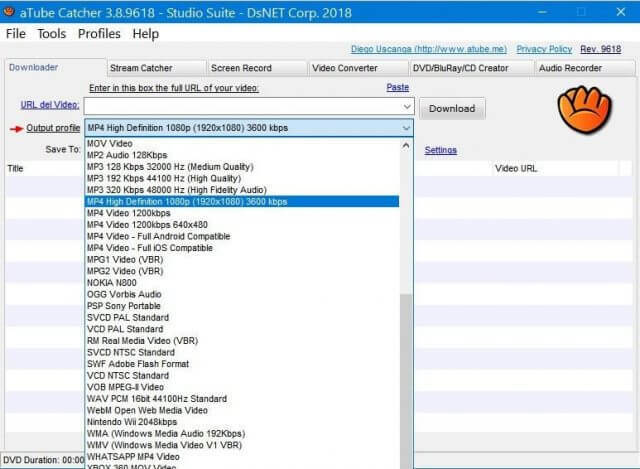 I wrote before about using 4K Video Downloader to download YouTube videos. One reader suggested another downloader and I decided to check it out. It’s called aTube Catcher. Be careful during the setup– it offers to install McAfee Web Advisor and The Brave Browser. Accept if you want any of these or just click on Decline. Once installed, open it up and you’ll get a colourful tiled screen with a few program options. Right now I’m only concerned with the downloader, so you can just close this and if you want, check the Don’t show again box towards the bottom. Some settings I like to change are the download folder and the default video settings. Just click on the line that starts with Save To: c:\users\(your account name)\videos. 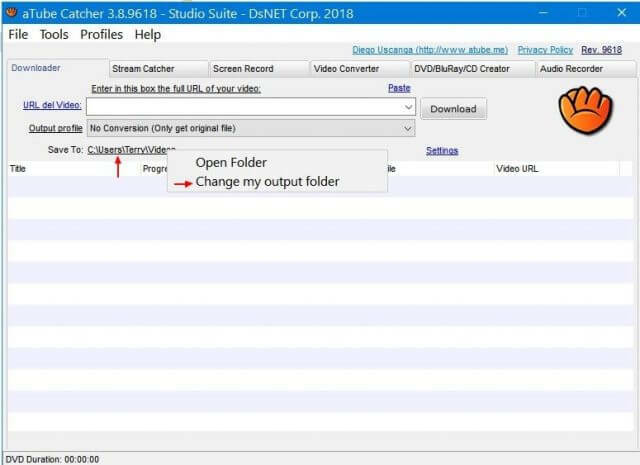 Then select Change my output folder. Then just navigate to your download folder and select it. Click on the Output profile that by default says No Conversion (Only get original file). Click on the video format you want to save to, or MP3 if you want to convert the file to a music format. Now go to Youtube and find a file, highlight the web address (URL) of the video, or click on the Share button just under the video. 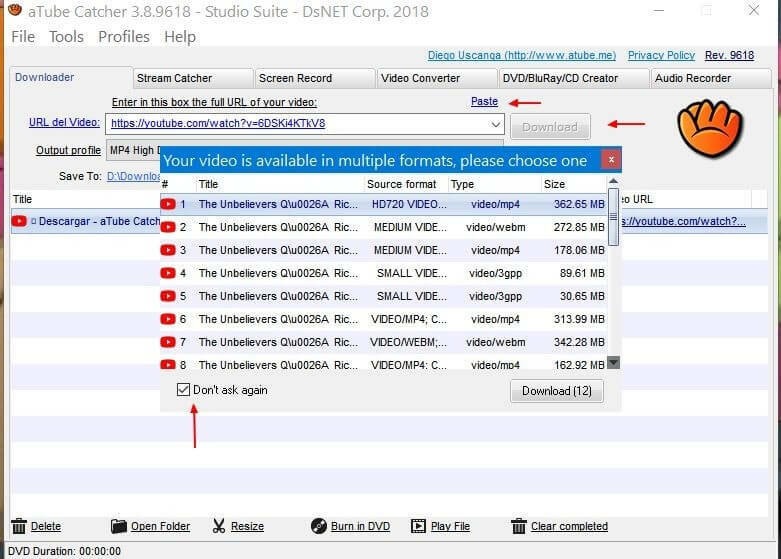 Highlight the video address and then right-click, and Copy. Then go to aTube Catcher and click on the Paste button (just above the Download button). Then click on Download. For some reason, this program insists on asking you to confirm the download type. It should still be showing the one you set previously. You can check the Don’t ask again box in the lower left-hand corner. It should start downloading and end up in your download folder. This program has a few other built-in options. Don’t be afraid to play around with it. So, what is your favourite downloader? Terry great article but you forgot to mention which do you recommend 4K or Tube catcher? aTube downloads the files fast enough but the conversion to the chosen format is slow. aTube also has more options, but being a creature of habit, I’ll probably stick with 4K for now. I will keep aTube on my system, fool around with it a little bit, and see what happens. 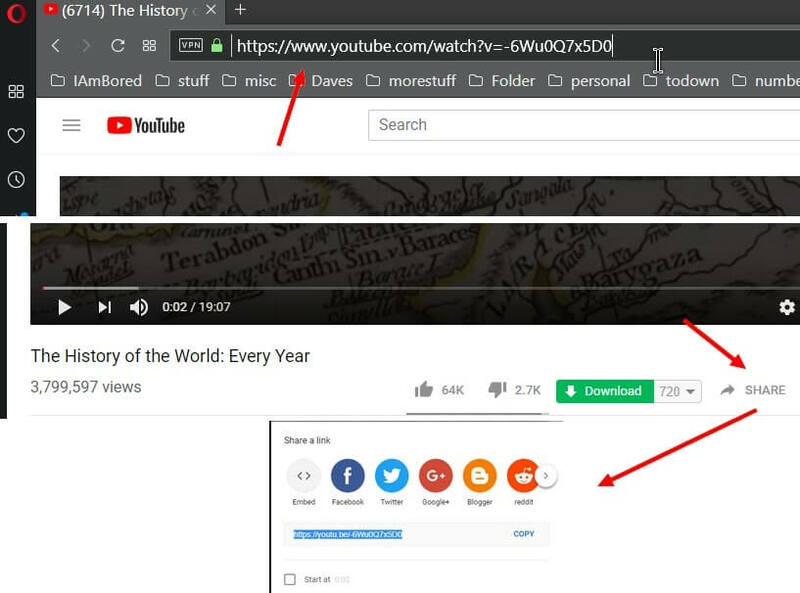 I use the Avast Secure Browser https://youtu.be/r_VLA0HMLQM which comes with a free built-in YouTube Downloader. Thanks. I’m going to check it out. Will this produce CDs that can be played on an ancient Wurlitzer Jukebox? I have a very annoying and demanding neighbour who expects me to be able to do everything computer orientated for nothing. Another case of one’s good deeds biting one in the bum! We all have people like this in our lives……. HELP! I usually call these types of people relatives. 🙂 But I’m not familiar with Wurlitzer Jukebox to answer this question… sorry. The CD standard seems to have remained constant over the years. 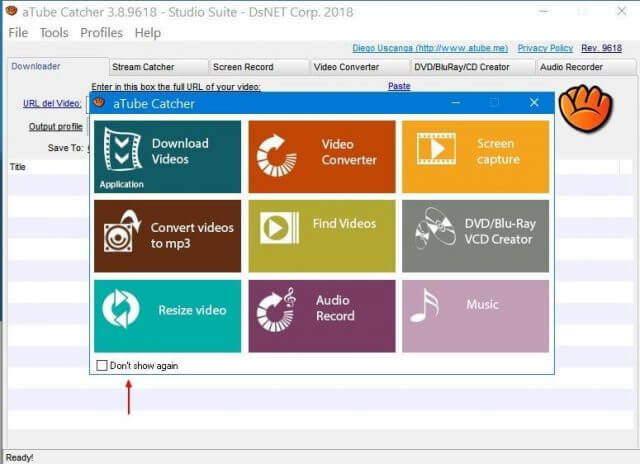 In aTube Catcher, if you click on the DVD/BlueRay/CD Creator tab and then click on the Project option for an Audio CD 74-80 min you can create a standard music CD. You can hide from relatives but neighbours turn up on your doorstep and know that you are in….. I should never have let on that I had a ZX81 and had built a few computers. But now happily ignorant and just surfing and playing CIV V are the limits of my knowledge. Thank you from the bottom of my wife’s heart – she was thinking of taking out a ‘contract’ on him. She is originally Californian…. but now living with me in Wales. Good advice re: McAfee, the intruder, the ‘welded-in computer rogue’, the uninstaller ignorer, the unwanted garbage. I uninstalled with Ashampoo Uninstaller but the dregs are in Windows Defender Firewall, and in the registry. Not trusting my further actions with possible computer malfunction. I am a highly experienced computer user/clients Mr FixIt/Mr Maintenance/MrHowToBy’Phone’. 30 years Computer User. them among the zillions of registry numbers. again with Ashampoo Uninstaller Pro does not remove everything. Installing the trial version through Adobe Acrobat, and other Adobe products allows an annoying pop-up to keep asking to purchase the ***** product. System Restore is not an option in this case. Download from primary site wouldn’t complete. Used alternate site. Downloaded fairly quickly. Submitted file to VirusTotal for analysis. VirusTotal analysis showed big-time malware infection: score 19/68. You said you downloaded from an alternate site. That is never a good idea. Since the developers of these scanners may use different settings at VirusTotal than what you’d see “Out Of the Box”, I ran a couple local scans too, and they both came up empty. I still have the downloaded file on my system. A Malwarebytes scan on it claimed it’s a PUP and Avast has no issues with it. I do believe it’s just the bundled software that is causing the alerts. I don’t consider it a threat. MWB is still unreliable and since taking over Adware Cleaner that programme has become inferior to the brilliant clean-up it once performed in the past. Also run a Kaspersky check, I don’t trust ‘bundles’ ! I still trust them both. No program is perfect. Good Morning. There’s no Reply button after your last msg to me, so I guess I have to open a new comment to explain – – what I meant by saying I downloaded aTubeCatcher from an alternate site is that I downloaded from the official aTubeCatcher website using the ‘Alternate Server Download’ button that is located below the ‘Download Now’ button. I’m no expert in this business, but thought that – being on the publisher’s website – would be a legitimate download. I ended up with the same aTube_Catcher.exe file that had started to download but would not complete when I used the Download Now button. The VirusTotal report of infections that I received notwithstanding, on-board scans of the file using Bitdefender and Glarysoft Malware Hunter reported the file to be clean. Ironically, I went back to the aTubeCatcher official website this morning to try the ‘normal’ download again only to receive a screen message saying the file cannot be found. I checked the Alternate Server Download button just to make sure my PC and Internet connection were working, and they were. All this stuff is above my pay grade so I’m bowing out! The comments are limited to nesting three deep. That’s why you saw no Reply link. My mistake– I didn’t realize the original site had an alternate download option. There are two links. The Download now link is only 2 MB in size but the alternate download link downloads a file almost 20 MB in size. Avoid the alternate down load link if possible. The 2 MB file has a VirusTotal scan of 8/69 while the 20 MB file 19/67. Terry. I have a problem with this aTube Catcher program. It downloads fine, but when I try to open/run the program it disappears. As you might remember, I use 8.1 and this problem exists on both my computers. Heimdal Security and Malwarebytes both identify the program as a pup and quarantined it, Mindblower! Yes,it sounds like your security programs are blocking and running install. I used a program once called YTD Downloader and one day I went to open it, it was completely gone. My Avira anti-virus at the time completely removed it without any prompts. It wasn’t a virus but adware supported. It’s a Chrome browser that includes a built in video downloader. By the pups don’t necessarily mean virus. They are just potentially unwanted programs. I meant to say: By the way, PUPs don’t necessarily mean virus. They are just Potentially Unwanted Programs. Thank you Terry. I am no stranger to pups, but most times they were caught after the program was installed and the program itself still remained in my download directory. The fact the entire program was blocked from running and removed without my consent is puzzling. My setting are to quarantine, not delete (remove). The idea two different anti-malaware products on two computers doing the each same thing to a program others have installed on their computers is what I find mysterious. BTW, I do have a way to capture YouTube videos, but only one video at a time, Mindblower!